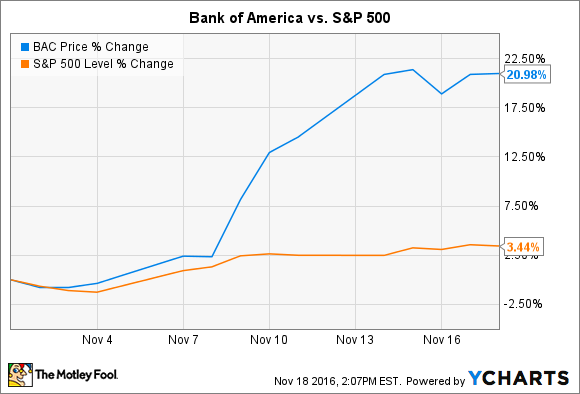 Given the recent surge in Bank of America's stock price, it's no longer as attractively valued as it was two weeks ago. It may seem odd at first that multiple analysts have begun downgrading their recommendations on shares of Bank of America (NYSE:BAC) in the midst of a rally in bank stocks. But the rally is in fact the reason analysts are lowering their ratings, as the bank's shares are no longer as cheap as they were before the post-election surge. Analyst David George at Robert W. Baird published a note to clients this week urging them to "take profits and selectively reduce exposure" to Bank of America. He also downgraded its stock from outperform to neutral, though he belatedly boosted his price target by $1 to $18 per share. To put that in perspective, Bank of America's stock is trading for just over $20 a share right now. Baird's move came on the heels of Guggenheim's downgrade of Bank of America's stock the prior day. Analysts at Guggenheim also believe that the bank's share price has gotten too rich, prompting them to change their rating from buy to neutral. Finally, analyst Matt O'Connor at Deutsche Bank reduced his rating on Bank of America from buy to hold. Notably, O'Connor downgraded the North Carolina-based bank on the day of the election -- that is, before it went on to surge by 18%. Bad timing, but it could happen to anyone in this business. The point to note is that all of these analysts think Bank of America's shares no longer have as much upside as they did before the election. That's obviously true. A stock that traded for $17 two weeks ago is much more attractive than the same stock that trades for $20 today. Investors shouldn't interpret any of these downgrades to mean that it's time to sell their stake in the nation's second biggest bank by assets. For a variety of reasons I've discussed over the past week -- here, here, and here -- shareholders in Bank of America can still be optimistic. The likelihood that interest rates will soon rise, coupled with the incoming administration's promise to ease regulations on the industry, will serve as a potent stimulant to bank profits. These forces could also free Bank of America up to boost its dividend by a substantial degree. It's worth noting as well that even though Bank of America's shares are certainly more expensive than they were two weeks ago, they're by no means egregiously overvalued. They trade for less than 13 times forward earnings. That's well below the average stock on the S&P 500, which trades for 18 times forward earnings. Bank of America's shares also trade for a reasonable 17% premium to its tangible book value. There will come a day when that seems cheap, as bank stocks tend to trade for two or more times book value at the top of a cycle. In sum, investors in Bank of America needn't be worried about analysts' recent downgrades. Its shares are still reasonably priced with room to run.